I have an obsession with snack sets. They make me think of well-dressed ladies getting together and playing cards or having a wedding shower, eating tiny sandwiches and homemade Jell-O salads and drinking tea or coffee from the tiny cups. I feel like now, when I get together with my friends, we are wearing yoga pants as we crack open a bottle of wine and some cheese and crackers and call it a day. I long for the days of more polished entertaining. I’m thinking of hosting a snack set luncheon when I return…maybe as a last hurrah for the summer? I’ll keep you posted. In the meantime…do you get all fancy when you entertain? I can’t be the only one who dreams of fancy parties with homemade salads and tiny glass cups, right? Snack sets are so cute! I have a set of fire king ones with a really cool 50s pattern. I’ve been wanting to use them but wasn’t sure how. Hosting a little party is a great idea. 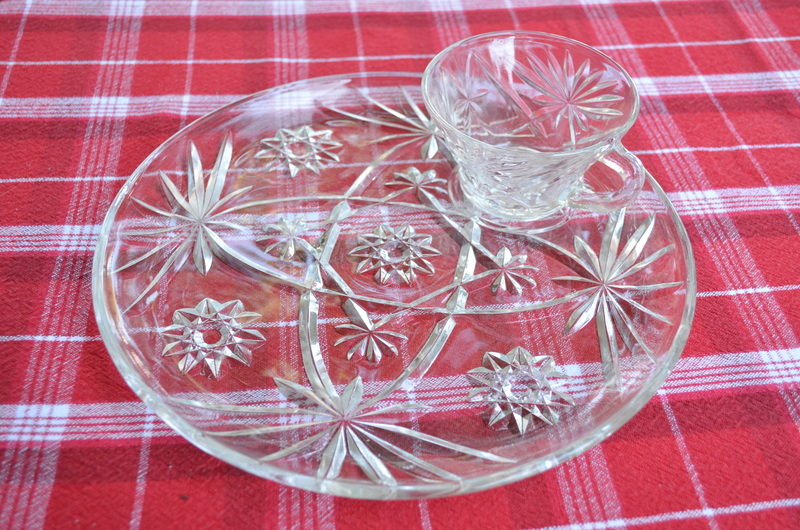 Snack Sets- the best kept secret of antique glassware collectors!Often not ever used & sometimes in original box,these sets are the best deal out there in the world of glassware! I bought about 8 sets recently on Ebay! Get shopping, girls!